Early in the 20th century, Jewish New Year card manufacturers began embellishing their cards with airplanes. They did so for three interrelated reasons: to call attention to the thrilling, modern invention of the airplane, to draw an analogy between the New Year and this new means of travel, and to use the airplane to highlight the changing status of women. Airplane pictures mirrored the tremendous emigration from Eastern Europe to the West in the early part of the 20th century and were a symbol of progress and modernity. Frequently, these Jewish New Year or shana tova cards were published in Europe for Jewish relatives who had already settled in the West. For example, a 1910 postcard from Poland typifies the newcomers’ state of cultural flux by printing the greeting or blessing in three languages: English, Hebrew and Yiddish. While the traditional Hebrew blessing reads: Be inscribed for a good year, the Yiddish is considerably more suggestive (read: “flashy”). It reads: The airplane carries us quickly/ and it is dizzying to the eye./ Tell me, is it from the flying/ or from our romantic joy. In other New Year cards, however, the woman is significantly more pro-active. For example, in one card (printed in Germany, but sold in the US by the Williamsburg Postcard Company around 1915), she is a sort of airborne mail carrier or post-mistress, dropping Hebrew-addressed New Years greetings to unseen recipients. The Yiddish inscription in the upper right corner reads: We bring you good tidings/ a wonderful time is approaching/ of light and radiance, of happiness and joy/ the world will be renewed. The optimistic tone of this message reflects the hope that WWI would soon end in Europe. Yet even more progressive are cards showing women in absolutely central and egalitarian roles. Cards produced around 1915 show women as solo pilots. In one figure, author-researcher Hasan-Rokem suggests the Yiddish text in the upper right is either idealistic or prophetic in nature: With a New Year in her hand,/ she floats out into the world;/ somewhere in a distant land/ a warm heart anxiously beats/ she is expected with hope. And yet, not all cards showed women in control in such a progressive light. In one example, a woman pilot is dressed for an evening-out-on-the town. Her hatless head reveals a nicely bobbed hairstyle while the top of her dress exposes her left shoulder. Frightfully, in Yiddish she admits she is lost, hoping for some kind of autopilot solution: Fly, then, fly my airplane/ oh, I don’t know where I am/ upon whoever comes my way /I shall strew my flowers. The card manufacturers present a conflicting picture of this early twentieth century woman. On the one hand, as a woman pilot she signals an unprecedented level of liberation, taking over what had generally been seen as a man’s vocation. On the other hand, she is painted as flustered by the prospect of flying the plane. It remains an open question whether the card company was implying this “new” woman was ill-prepared for the task. Significantly, the idea of illustrating Jewish New Year cards with airplanes did not end in this period of mass immigration. Jumping ahead some 30 years to WWII, one notes that American Jewish soldiers likewise sent loved ones New Year’s cards with pictures of airplanes. These later cards, however, differed in two respects: war scenes were visible on the cards and women were missing. Later, Israeli-made airplane shana tova cards gave a positive spin to both immigration to Israel and to success in battle. Yet here again, women are missing in the illustrations. This perhaps shouldn’t be surprising, seeing as very few women have served as Israeli Air Force pilots. While women piloted planes in Israel’s 1948 War of Independence, shortly after the Israel Defense Forces banned women from becoming pilots. It took a Supreme Court ruling in 1995 to stop denying women the opportunity to fly for the Israeli air force. Illustrated airplanes creatively raised issues about leaving one’s homeland, settling in a new land, and alluded to concerns over involvement in large-scale conflicts. The uneven progress of women in the work world is reflected in the appearance or absence of women flyers in Jewish New Year cards. Fields, Deborah Rubin. "Propelled into the New Year." 1 April 2015. Jewish Women's Archive. (Viewed on April 19, 2019) <https://jwa.org/blog/propelled-into-new-year>. 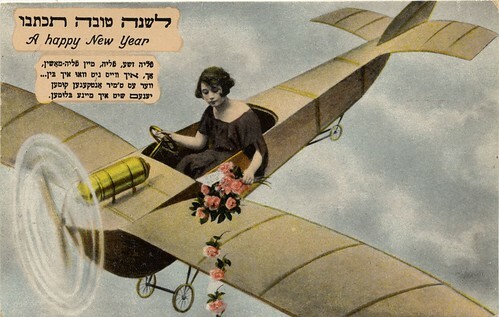 Jewish New Year Postcard with airplane.